I can definitely see the advantages of plain text emails. In fact I like these way better than, for example, getting an email written in comic sans. But just as with simply choosing a nice font for your email, or designing a full fledged HTML mailing there might be some things that you want to think about. 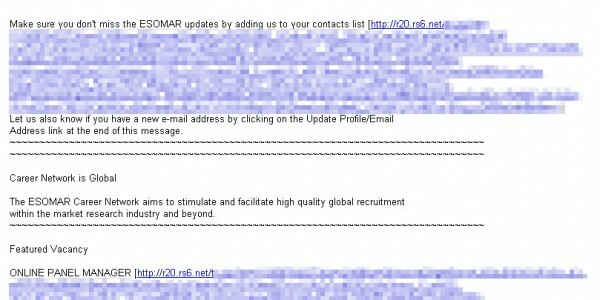 Just this morning I found an email in my inbox, coming from the good people of ESOMAR. Now, this is nothing about ESOMAR in particular, but it’s a good example of what I’m trying to tell here. The point is that plain text emails don’t go all that well with links that go beyond just linking to a website. We’ve already seen this with email lists, but as websites want to pass more and more variables in a link for tracking and other uses, they tend to get quite long. This mailing here even seems to obfuscate the information in the links a bit. 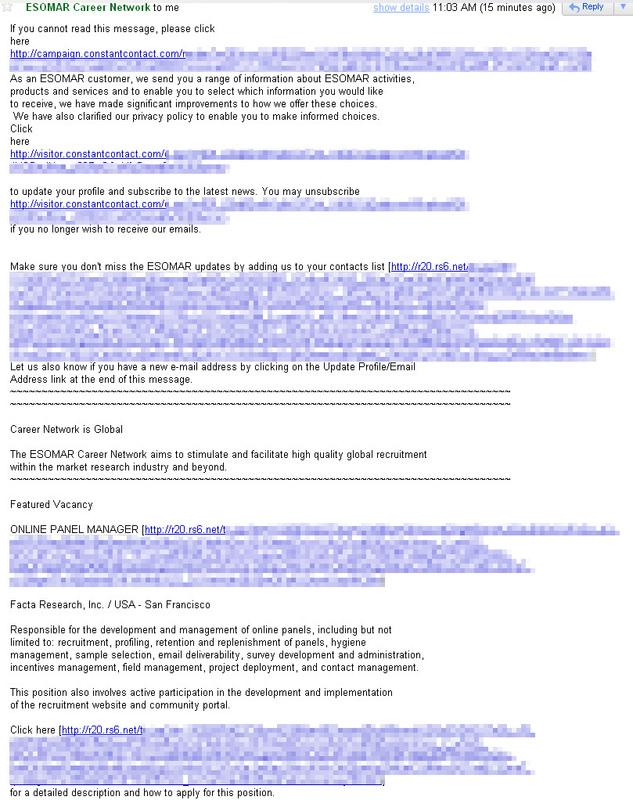 (as I didn’t feel like figuring out what they are passing there I just blurred it all, but this is the actual extend of the links) Now, I do think that ESOMAR is giving quite decent information in the actual text of this email, the links make it almost unreadable. So yes, I think in the end the “If you cannot read this message” is applicable to me here. 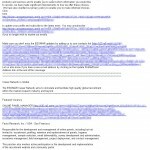 What do you think: are links like these OK in plain text emails, or should we focus on the text and minimize the length of the links in such cases?